Lead author Dr. Tim McClanahan surveys high fish biomass on reefs off Vamizi Island in northern Mozambique. Credit: Emily Darling / WCS. Scientists from WCS (Wildlife Conservation Society), University of Queensland, James Cook University, and Macquarie University have completed a massive study that will help communities and countries of the Western Indian Ocean measure and restore fish populations while identifying the best policies for achieving global sustainable and conservation targets. The researchers utilized more than 25 years of data from fish surveys and research focusing on the effectiveness of fishing closures to generate predictive models of recovery that will help marine managers better assess the state of reef systems and their fish populations in the Western Indian Ocean. The findings use previous studies to predict the recovery time of depleted reefs to levels where fishing is sustainable or conservation objectives are reached. The study titled "Modeling Reef Fish Biomass, Recovery Potential, and Management Priorities in the Western Indian Ocean" appears today in the online journal PLOS ONE. The authors are: Tim McClanahan of the Wildlife Conservation Society; Joseph M. Maina of the Wildlife Conservation Society, the University of Queensland, and Macquarie University; Nicholas A.J. Graham of James Cook University and the University of Queensland; and Kendall R. Jones of the University of Queensland. "This study covers 45 years of fish recovery in 18 of the region's best protected areas—an area of 7,000 square miles—to produce these unusually extensive findings. The study will help guide conservation actions for the entire Western Indian Ocean, a region filled with coastal communities that rely on fishing for their livelihoods," said Dr. Tim McClanahan, Senior Conservationist for WCS and lead author on the study. "Fish biomass is key for maintaining the ecosystem services that keep reef systems functional; fishing and other human activities can disrupt these sensitive ecosystems. 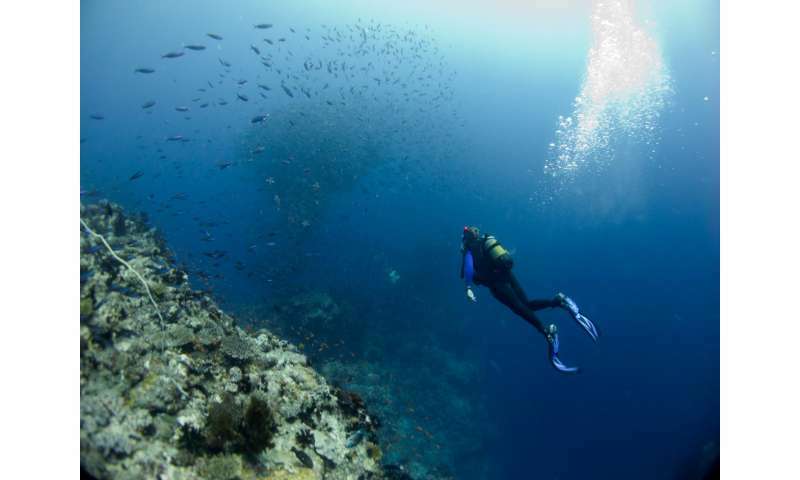 Fortunately, we can leverage previous research to identify predictors that will help guide governments at many levels in ways that can safeguard coral reefs, fish populations, and the communities that rely on them." Using the data collected between 1987 and 2014, McClanahan and his collaborators developed and tested predictive models to determine which factors correlated to levels of fish biomass in the region's coral reefs, a few of which explained up to 66 percent of the observed variability in surveyed reef systems. The most important predictor of fish biomass in the research team's models was fisheries management types or restrictions. Fishing closures with a high degree of compliance and enforcement consistently led to significant increases in fish biomass, as did strict gear restrictions. On the other hand, fished reef systems with no gear restrictions led to a significant decrease of fish biomass. Distance between coral reefs and the nearest fish market made a big difference as well; a shorter distance generally corresponded to a lower fish biomass levels. Of less importance were water temperatures and some potential predictors such as habitat; water quality and current speeds were not modelled because most sites lacked these data. 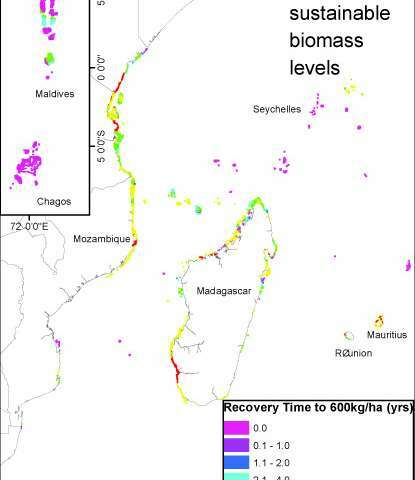 The study generated a map of coral reef biomass in the whole Western Indian Ocean along with a recovery time estimate of 8.1 years for individual reef systems to reach 1,150 kilograms of fish biomass per hectare, the critical level to conservation coral reef ecosystems. The average estimated time for a depleted reefs to support both maximum species diversity and sustainable yields was between 1.74 and 2.9 years in duration. Recovery times varied by country and were dependent on the state of their resources. In the most resource-depleted countries, recovery could take as long as 20 years. A map on time for fish to recover to sustainable biomass levels. Credit: WCS. The authors also conducted a prioritization analysis to help select areas for increased management efforts. While prioritization exercises have traditionally employed conservation targets based on global treaties (for example, Aichi biodiversity targets), the study used empirical and ecologically informed fish biomass recovery targets, therefore enhancing the chances for management effectiveness in priority areas. Prioritization minimized the time needed for fish biomass to recover to achieve a nation's sustainable and conservation goals. 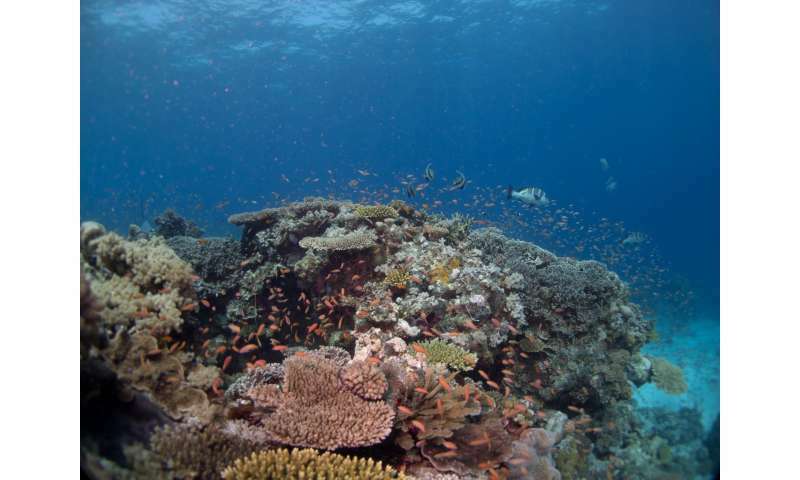 One analysis identified the ideal areas for protecting reefs to achieve protection of 20 percent of coral reefs for conservation or no-fishing zones and having 50 percent of reef systems contained in sustainable fishing zones. Consequently, nations are provided with a means to select reefs for these management goals that will lead to the most rapid recovery. Finally, the study examines three potential management scenarios for achieving the conservation goal of protecting 20 percent of the region's reefs. The fastest way to achieve this goal was to get countries to collaborate on a regional conservation plan and protect areas with the highest fish biomass. National conservation plans would be nearly as effective and would not require the efforts of achieving regional collaboration. A final option considered a plan whereby fishing communities protected the most resource-depleted reefs first. The authors suggested the some combination of the three approaches is likely to succeed by relying on all scales of governance rather than just one. "Implementing management measures to restore fish biomass is the number one action coastal communities, nations and regions can take themselves to help coral reefs face the coming threats of global climate change," said Dr. Caleb McClennen, WCS Vice President, Global Conservation "The study provides three complementary pathways to achieving sustainable fisheries in the Western Indian Ocean region within a decade—articulating empirically sound actions that critical for the long-term viability of some of the world's most biodiverse and important coral reef systems."